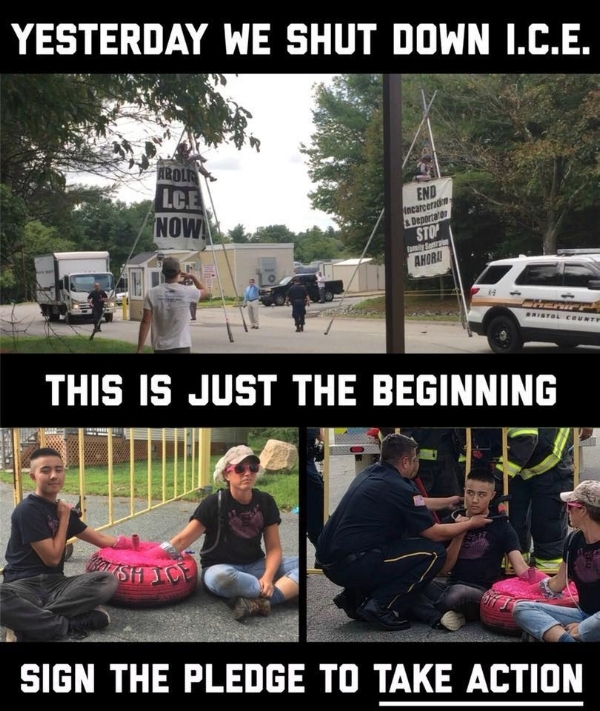 On August 20th we deployed multiple blockades in North Dartmouth, Massachusetts that shut down all entrances to the Bristol County Jail and an Immigration and Customs Enforcement (ICE) detention facility. At the facility’s main entrance, climbers scaled two 24 foot tripods, while at the second entrance, two people locked into a concrete barricade, with one of them also locking their neck to the gate. The Bristol County Sheriff’s officers responded with violence. They pulled apart and tore down both tripods causing the climbers to fall and slam into the pavement. The sheriffs then used pain compliance on Sherrie, an indigenous woman of color and a co-founder of FANG, in an unsuccessful attempt to get them to release from their lockbox. Footage of the tripod blockades being attacked can be seen here (trigger warning, police violence). The Bristol County Jail, and the head Bristol County Sheriff Thomas Hodgson, are notorious for their repressive tactics. Last year Bristol County signed a 287(g) agreement with ICE, which allows state officers to fulfill the duties of immigration officers and detain community members in local prisons and jails. The county also profits from the inhumane and immoral detention of undocumented immigrants through a deal to hold people arrested by ICE at their jail. In fact, at the exact moment that we deployed, Sheriff Hodgson was sitting at an event in Washington, D.C., listening to Donald Trump praise ICE officers. On July 18th in response to the deplorable conditions at the Bristol County Jail, including inedible food, nearly nonexistent medical care, and abuse from facility employees, ICE detainees launched a hunger strike. By the next week the general population at the prison was also staging a hunger strike in solidarity with the ICE detainees. Then on August 21st on the 187th Anniversary of the Nat Turner Rebellion, the National Prisoners Strike was launched to demand an end to prison slavery, with waves of strikes and actions taking place in dozens of prisons. The demands of the ongoing strike can be found here. It was with this backdrop that we took action, and we are going to keep taking action until we #ShutDownICE and hold institutions like the Bristol County Sheriff's Department accountable. Pledge to Take Action to #ShutDownICE.